Here's another view of the Columbia during the flood of May 1948. We're looking north toward the Hood River- White Salmon Bridge, which managed to stay dry. Here's another view from that time. I wonder how the railroad tracks on the Washington side fared. They are close to the river. I checked the front pages of the Mt Adams Sun May 1948 issues. Nothing on the front page until May 28. SAWMILLS SHUT DOWN BY HIGH WATERS DURING PAST WEEK. The Columbia River and many of its tributaries continued to trouble landowners and residents along their banks this week with unexpected high waters raising the crest above that anticipated at this time. Several dams in the upper Columbia and tributaries in Idaho were reported washed out adding to the flow and a cloudburst Wednesday afternoon in the Yakima River watershed made it necessary to evacuate a considerable area along its banks near Pasco. Locally, three sawmills have been closed down by the high water and work has been going on feverishly at the John Dickey farm in an attempt to keep the water diked from the gardens. It was necessary to turn the water into the upper field early in the week in order to control washing and save the dike and until Thursday the dikes around the other field had been kept above the water's crest. However, it became necessary to break the west dike to fill the lower field and the dike on the river side. The Columbia at Vancouver was reported the highest in 15 years, while locally its waters are crowding some of the dwellings along Columbia Street south of the tracks. Radio reports yesterday indicated continued rising of the water, reaching a point, the highest since 1894. Road trip from Portland to the Baldwin Saloon for lunch today.....not a breath of wind, river like glass....no spill at The Dalles dam.....Bonneville "pond" quite full. Todays picture was when we moved from 701 Prospect out to the "farm" on Belmont. 1948, the end of my working in the mill at Cooks on the Columbia.. We anchored the mill before going down river to help clean up the remains of the second most populated city in Oregon, Vanport City. My uncle lived at VanPort. I was born a year after the 1948 flood so I only have stories for memories. One was about VanPort and the other one was that my dad took his tractor and trailer down to help families living along the Washougal River. The Columbia was backing up tributaries and causing flooding. My husband's family lived on Government Island, so we have a good collection of stories and photos from the 1948 flood saga. They more or less gave up farming after losing and moving everything. A few days ago, Arthur featured a photo of the Portland Airport. 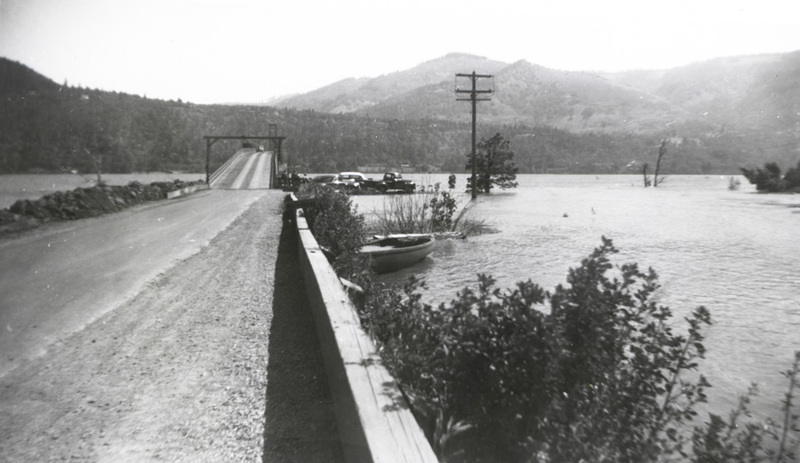 PDX was unusable for several months because of the 1948 flood.